Chubby. Curvy. Fluffy. Plus-size. Thick. Fat. The time has come for fat people to tell their own stories. The (Other) F Word combines personal essays, prose, poetry, fashion tips, and art to create a relatable and attractive guide about body image and body positivity. This YA crossover anthology is meant for people of all sizes who desire to be seen and heard in a culture consumed by a narrow definition of beauty. 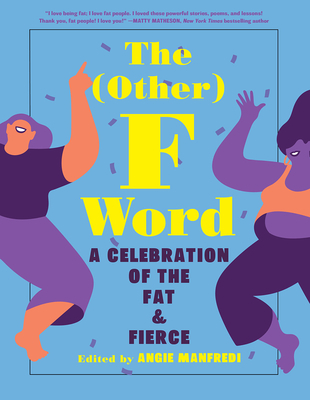 By combining the talents of renowned fat YA and middle-grade authors, as well as fat influencers and creators, The (Other) F Word offers teen readers and activists of all ages a guide for navigating our world with confidence and courage. Angie Manfredi is a librarian and writer who owns every season of Law and Order on DVD and sends over 150 handwritten Valentines every year. She has spent the last 11 years working directly with children and teens of all ages in a public library and now works in library consulting on all things youth services. Angie is fat and not sorry about it. She is a passionate advocate for literacy, diversity, and decolonizing the discourse surrounding children’s literature.